This card was made for a friend going through surgery today. I thought it might be nice for her to receive a get well soon card to lift her spirits. This card was made with a stamp from Delightful Inspirations. You can get free digi stamps for participating in their challenges each week. You can check out their challenges here. Fabulous - love the scene you created! Thanks so much for playing with Designed 2 Delight! 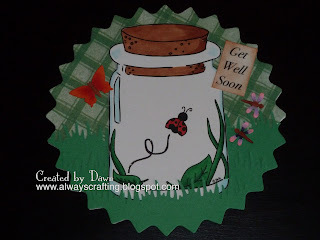 Dawn this is a beautiful get well card! Love the shape you used! Thanks for joining us at Designed 2 Delight this week. very cute! thanks for playing along with us on D2D!